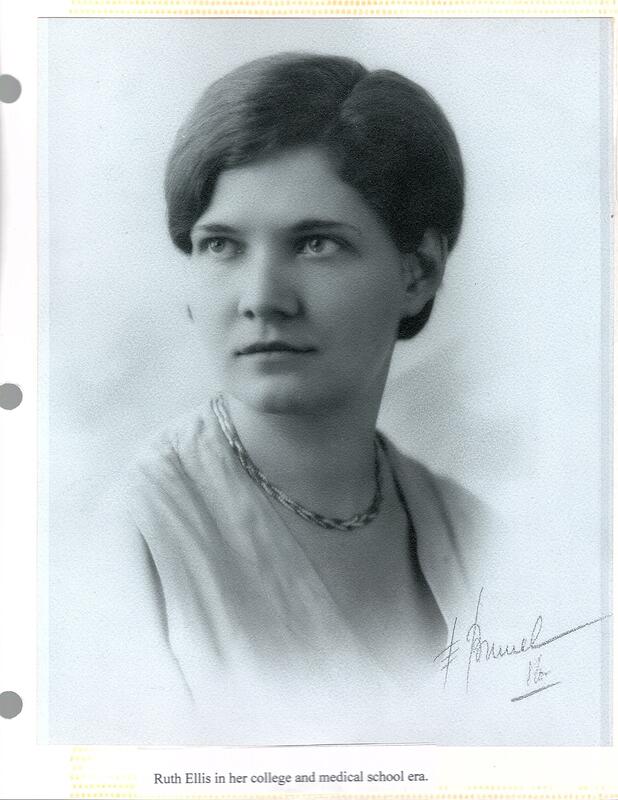 Dr. Ruth Ellis Lesh was born in Fayetteville Arkansas on June 18, 1910, the daughter of Dr. and Mrs. Edward Forrest Ellis. She attended the University of Arkansas, and received the B.A. degree in 1930. In 1933, she received the M.D. from Women’s Medical Collage of Pennsylvania, the first medical school to admit women. She then returned to practice medicine with her father, Dr. E.F Ellis. Dr. Ruth (known affectionately by this name) again attended the University of Arkansas and received the M.A. degree in Philosophy in 1936. That same year she married Dr. Vincent Lesh of New Jersey. For the next 2 years she studied obstetrics and gynecology at the University of Pennsylvania Graduate Medical School. In 1938 the couple came to Fayetteville and opened a joint office for medicine and surgery. Later they established separate offices, with Dr. Ruth practicing obstetrics, gynecology and general surgery. Two children were born to the Lesh family, Susan Elizabeth and Vincent Edward. Dr. Ruth received many awards and honors. She was elected Second Vice President of the Arkansas Medical Society, the first woman to hold an office in the state organization. She served as President of the Washington County Medical Society and was a Founding Fellow of the American College of Obstetrics and Gynecology, was a Fellow of the American College of Surgeons, and a fellow of the International College of Surgeons. She became a Senior Surgeon in the U.S. Public health Service Reserves and later became its Medical Director. An ardent writer, she published numerous articles in medical journals as well as articles on medical history in Arkansas. Locally in Fayetteville Dr. Ruth was the Chief of Staff at Fayetteville City Hospital and also at Washington Regional Medical Center. For 20 years she was on the Governing Board of Fayetteville City Hospital. She was consultant for Family Planning with EOA, was a clinician with the Arkansas Family planning Council, and was Chairman of the Board for the Fayetteville Chapter of the American Red Cross. Non-medically related contributions were through the Methodist Church, the PEO Sisterhood, the Chi Omega Fraternity and the Daughters of the American Colonists. In 1989 Dr. Ruth established a scholarship for senior women students at the University of Arkansas School of Medicine whose primary interest was in surgery. It was given in honor of her father, Dr. E.F. Ellis whom she said was first to recognize female doctors and encourage their involvement in surgery. Ruth was known as a pioneer for women entering medicine, and was a respected and beloved physician for 42 years. She retired in 1975. On April 16, 1993 she died at the age of 82 and is buried in Evergreen Cemetery in Fayetteville, Arkansas.